I was talking with a young colleague – a paid search specialist – about some of the incredible learning opportunities available with clients who could afford testing. “But how can you take those learnings and put them to work for smaller clients,” I challenged. I was reminded of this as I reviewed the just-released M+R Benchmark Report. This is “the largest, most comprehensive dataset” yet for what I believe has become the industry-leading benchmark on nonprofit online fundraising (154 organizations, nearly 5 billion email messages, more than 500 billion web visits and nearly 12 million donations). Constituent lists continue to grow (email up 11%, social even more). Organizations sent more emails per subscriber per month (up 11%) and spent more on digital advertising (up 24%). Total online revenue grew by 24%. Just one nagging little negative: virtually every individual email metric declined. But back to this learnings concept …. I found the section on digital advertising particularly interesting. On average, small organizations (email list of less than 100,000) spent 3¢ per dollar of revenue in this arena, medium organizations (100,000 to 500,000) spent 5¢ per dollar and large organizations (500,000-plus) spent 8¢ per dollar of revenue. 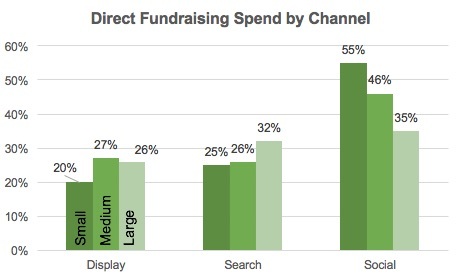 Large organizations focused virtually all of their spending on direct fundraising (68%) or lead generation (26%). Small organizations, by contrast, spent more than a third of their resources on Awareness/Education. While direct fundraising, at $40 to $200 per new donor, may be a bit too costly for smaller organizations, it would seem that lead generation, at $1.46 per new name, could be more realistic. Cost is likely a driver in channel choice as well. Social media accounted for more than half (55%) of the total spend for small organizations and far less (35%) for large. The comparative cost per gift reported is $41 for social, $65 for search and $204 for display. This is an area that will continue to grow. This year, small organizations nearly doubled the amount they invested in digital advertising and large organizations increased their spend by 70%, while medium organizations held fairly steady (3%). There’s a lot of material here; we may use a future blog post to come back and address more, like those declining email metrics, for example. In the meantime, one more reminder: download your copy today!